Air Humidifier Market size was valued at around USD 2 billion in 2017 and is estimated to exhibit over 4.5% CAGR from 2018 to 2024. Health awareness and changing weather conditions will drive commercial and residential air humidifier market size. Humidity may drop to 10-20% against the requirement of 30-50% causing health problems. Adverse health issues including respiratory distress, nose and throat lining, dry skin, cracked lips and dry cough have increased the consumption of product. Utilization of air humidifier in hospitals has spurred owing to requirement of prevention from biological contaminants. Low humidity leads to static electricity problem causing accumulation of small dust and textile particles on electrically charged surfaces that destroys semiconductor devices. Computer microchips gets damaged with static discharge over 10 volts. Compact disks get damaged with release of static discharge causing irreplaceable loss. In addition, papers and artworks become brittle in low humidity conditions that hinders the working of copiers and printers further enhancing the air humidifier market share during forecast period. American Society of Heating, Refrigeration and Air Conditioning Engineers (ASHRAE) guides the construction of humidity controlled commercial and institutional buildings present in hot and humid climates. 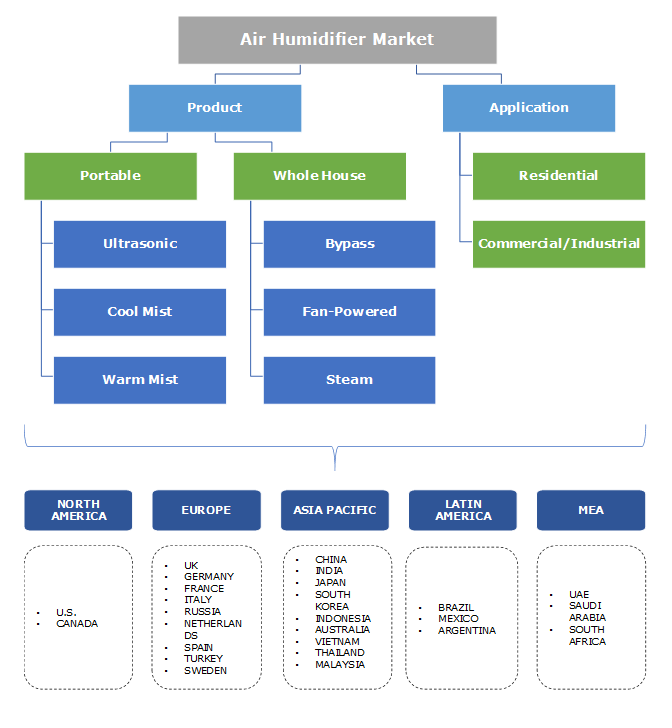 United States Environment Protection Agency (USEPA) provides the information regarding the health risks arising from uncontrolled humidity environment and recommends the maintenance procedures, further fuelling air humidifier market size from 2018 to 2024. Rise in construction industry will drive growth of air humidifier market during the forecast period. Increasing construction of residential buildings, hospitals, schools and departmental stores witnessed surge over past few years. Construction industry will grow up to USD 8 trillion by 2030 with presence of over 20,000 engineering and construction companies across the globe. Requirement of maintaining enhanced surrounding quality in commercial buildings including offices and malls will enhance product demand. The product usage assists in long lasting furnishing of paints and wall papers as dry climate leads to peeling off and gap openings in wooden enclosures. Accumulation of white dust and pathogens may limit air humidifier market as wetness in the filters lead to breeding of pathogens. White dust is caused due to chemical components during humidification process that may pose some serious health concerns. However, methods suggested by USEPA such as using of distilled water or demineralized cartridge can prevent this problem. In 2017, portable air humidifier market accounted for around 90% volume share and is expected to continue its dominance over the next seven years owing to high convenience, mobility and portability offered by these systems. Easy installation and low energy consumption of these devices suitable for single room will improve the product penetration over the forecast timeframe. Low cost of the product compared to counter parts is improving the consumer preference for residential applications. However, the product requires constant cleaning to avoid bacteria in the reservoir. Warm-mist air humidifier market size is anticipated to surpass USD 500 million by 2024. The growth in the segment can be attributed to bacteria free environment offered by these devices. Ultrasonic systems are forecast to exhibit strong growth owing to quiet operation and low maintenance requirement. Features such as ease of usability and simplified installation process are projected to drive industry growth during forecast period. Whole-house market segment is anticipated to witness strong growth prospects owing to features such as low power consumption and maintenance cost. Dry environment is likely to cause serious production troubles or material deterioration for hygroscopic materials such as paper, wood, fibres, textile, chemicals and leather. Increasing consumer awareness in conjunction with strong demand for healthy atmosphere for infants will boost air humidifier market across residential sector. Residential air humidifier industry is estimated to account over 28 million units in 2017, owing to strong preference for personal comfort in various indoor settings. Substantial reduction in respiratory illnesses with use of these devices is anticipated to propel product demand from 2018 to 2024. Commercial & industrial air humidifier market is estimated to exceed USD 1.5 billion by 2024 with requirement of optimized energy consumption accompanied by low operational cost in industry sectors including automotive, medical and pharmaceutical manufacturing. These devices ensure efficient humidity control, along with high compliance ensuring applicable standards. North America led by the U.S. air humidifier market size will surpass USD 1 billion in 2024. Presence of government organizations including ASHRAE and USEPA promoting and increasing awareness towards usage of these devices will accelerate product demand. Rising adoption of the product across hospitals operating rooms and semiconductor manufacturing plants will spur demand during forecast period. Europe air humidifier market share contributed over 26.5% of the overall industry revenue in 2017. The superior share can be attributed to high consumer awareness and colder climatic conditions across the region. In addition, rising purchasing power index will further increase product demand. MEA is at a nascent stage and will register healthy growth due to high buying power. 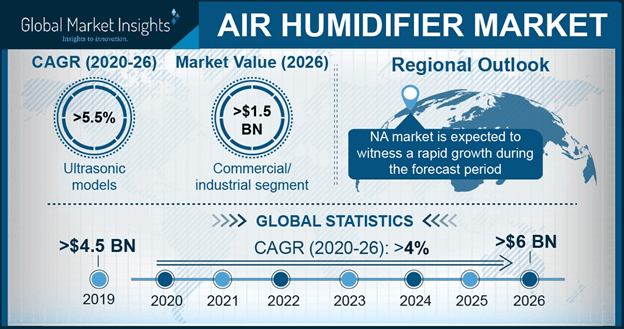 Favourable trade policies and increasing commercial construction in the region will boost air humidifier industry growth. Major players of air humidifier market share include Boneco, Carel Industries, Armstrong International, Carrier and DriSteem. Other prominent industry participants include Nortec Humidity, Procter & Gamble, Honeywell, Neptronic, Philips, Vornado Air, Stadler Form, and Winix. Companies are undergoing mergers & acquisitions to remain competitive with their counterparts. For instance, in February 2014, Armstrong International acquired Veris Incorporated that helped the company to expand intelligent system solutions portfolio with Veris presence over 36 countries. Companies are strengthening their R&D segment to overcome the market challenges and manufacture product as per consumer demand. In March 2018, Honeywell launched product offering control for white dust and removes pollen, smoke and bacteria. In 2015, Stadler Form made technological improvements to its Oskar product offering. The updated model offers a reminder indicator that signals need of filter change. The added feature may help in fuelling air humidifier market growth. Air humidifiers are mainly used to provide comfortable and healthy environment for residents, workers, preserve material properties and prevent static electricity build-up. Humidity specific industries including printing, packaging, paper, textiles, plastics, electronics, pharmaceuticals and automotive manufacturing are likely to exhibit high product demand to avoid shrinkage, curl and brittleness in papers. These devices play an important role in cold storages to preserve freshness and protection against dryness due to cold temperature. In addition, galleries and art museums install them to guard delicate artwork, and comfort visitors against dryness caused by heaters in cold weather. Commercial places get prone to static build-up & sparks if humidity level is below 45% RH (relative humidity). At condensed levels, static build-up takes place between 45% RH to 55% RH, the product assist in reducing static build-up and humidity level is more than 55% RH.